I love IndyCar, but that break between the opening race at St. Pete and this weekend at Phoenix was just too long! Okay, maybe I’m being greedy. Nonetheless, it’s race weekend at the newly named ISM Raceway, and I think everyone’s excited to see how the drivers react to the new aero kits in their first short-oval outing, under the lights in the Arizona desert. As we saw in the opener at St. Pete, there’s a lot of unpredictability with this season, and with that being said, congrats to open-wheels.com Fantasy league competitor Gordon M. on his first place, 150-point weekend! There’s a lot of question marks going into this weekend. Looking back at the test, there’s a solid slate of drivers that can take the checkered flag on Saturday night, and that is absolutely thrilling to me! Let’s get to the good and maybe not so good choices for this weekend in Fantasy IndyCar. The Frenchman was a force to be reckoned with last year, and it’s always hard to bet against a defending race winner. Look for Pagenaud to bounce back from St. Pete with a strong run in the desert. Perseverance was the key for Graham at St. Pete, and it paid off with a solid second place finish. With teammate Takuma Sato topping the February test session and a load of confidence, I’d say it’s safe to say the Rahal-Letterman-Lanigan boys are going to be out for blood come Saturday. The Indy 500 champ is strong on ovals, topping the February test at Phoenix. With not a lot of information on how the new kits will react in race condition on a short oval, it’s always good to look at experience and positive results, both of which Sato has to offer. Sticking with experience; Scott Dixon. You’ll probably see his name a lot in the “Strong Choices” section of my pieces this year. Dixon has made a very successful career of taking care of his car and putting himself in a position to win at the end of a race, whether that be by his mastered fuel-saving technique or sheer speed. Dixon, like most days, is a strong choice for Saturday. I’m interested to see how Rossi reacts after facing his first “controversy” in the series. I personally think he will come out and post a strong top-10, possibly even top-5 finish. Rossi is a racer, and he’s not going to let the mishap from St. Pete detour his quest for Verizon IndyCar Series race wins and ultimately, a championship. The oval expert is back as the only owner-driver in the field, and after a disappointing 2017, I think it’s safe to say Ed has something he wants to prove; that he’s still capable of winning in IndyCar. 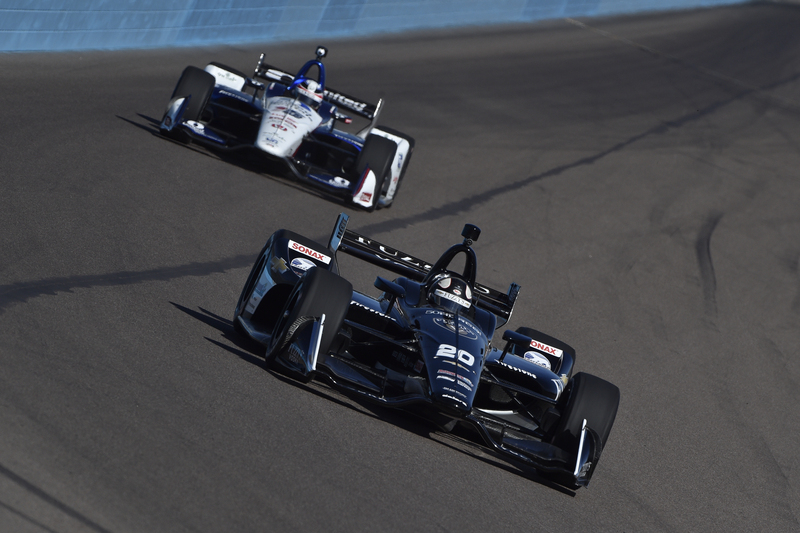 ECR racked up a Podium at Phoenix last year with J.R. Hildebrand, they may just be able to do so again with the boss in the car. This is the dark horse of the field for Phoenix. He showed some strong results at the Phoenix test, and has shown that he can be quick in any car that he drives. Will the young rookie shine on the Saturday night stage? I think it’s possible, and I’m sure a few are willing to gamble and find out. After struggling to get up to speed with rookie Rene Binder, Juncos Racing is sure to have its hands full this weekend. Kyle Kaiser is quick at Phoenix, having won there in Indy Lights. I think he’s still a long shot for his first race of 2018. After a strong showing in St. Pete, the second half of the SPM Canadian duo is set to make his IndyCar start on an oval. The team seemed to struggle in testing, which could hurt them rolling off the truck for practice. It will be interesting to see how Wickens adapts on the short oval in race conditions. Good luck, and as always, may the best fan win! Join the Open-Wheels IndyCar Fantasy league and compete against IndyCar fans, friends and the contributors of Open-Wheels.com! Just visit Fantasy.IndyCar.com and search “Open-Wheels.com” in the league search box.